Program : Cloud contest, DIY contest etc ... On-site catering available: drinks, meals (foodtruck). « Did you like the 1 and 2 Vapéros? Do not miss this one. We are preparing a crazy vapo". This year, for the second time, it's happening at: At VandB at ARRAS: 3 ter, Copernic Street, 62000 Arras To indicate your arrival, it happens ithis. - The montages made on the atos can not be lower than 0.10 ohms. - Noisy Cricket Series Pure Boxes will not be accepted. The best 3 win prizes offered by Guild partners. Our friends from home Vapadonf will also provide other information as soon as possible. To find out more right now, you can also visit official page of the event on Facebook. 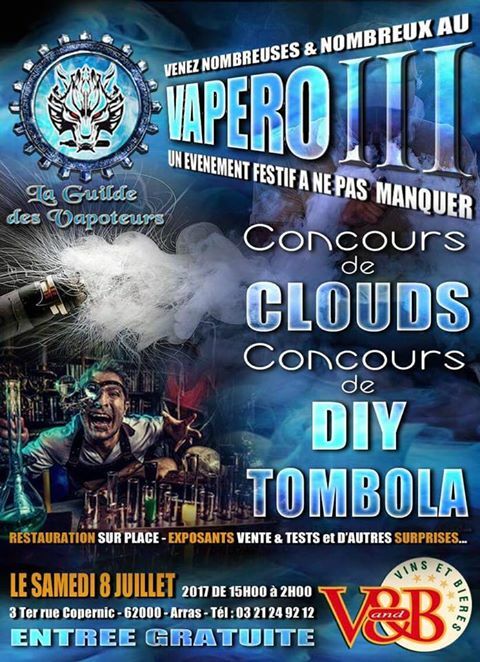 Competition - The Vappers Guild Max Vape The Vape Engine Guild Allday.fr, the famous French e-liquid store, joins forces with the Vapor Engineers' Guild to win 3 members exceptional prizes.